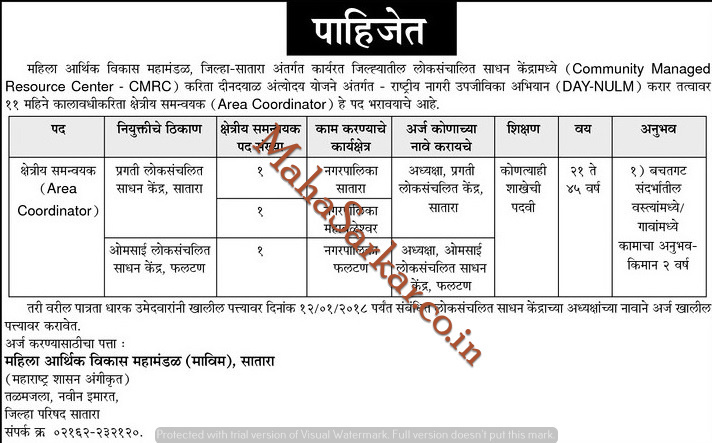 MAVIM Satara (Mahila Arthik Vikas Mahamandal), Satara Published Job Notification for 03 Area Coordinator Posts. Candidates who wish to apply must look at MAVIM Satara Area Coordinator Recruitment 2018. Eligible candidates can apply offline before 12th January 2018. Education Qualification: Any Graduate Degree and More. For Post wise Education Details follow the detailed advertisement. Interested & Eligible candidates can send their application along with all the necessary documents and testimonials to Mahila Arthik Vikas Mahamandal Satara, Ground Floor, New Building, Jilha Parishad, Dist.Satara – 415 001. Start Date to Apply offline: 06-01-2018. Last Date to Apply offline: 12-01-2018.